The Mid-Autumn Festival (中秋节, zhōng qiū jié) is one of the five most important festivals in China. The other four are the Chinese New Year, the Ching Ming Festival, the Dragon Boat festival and the Double Ninth Festival. Mid-Autumn Festival is a Chinese lunar festival. Therefore the date of celebrating this festival varies each year because it is determined based on lunar calendar, which is completely different from the international calendar. This year the festival is on Sep 19, and it will change again next year. Mid-Autumn Festival is also called as Moon Festival, for it is always full moon on that night. Moreover, the moon is the roundest and brightest of the year. Another reason is that celebrations of the festival are all about moon. In Chinese culture and literature, full moon symbolizes the reunion of family. It is believed that this festival is connected with the worship of lunar in ancient China, which can be trace back to the Zhou Dynasty. Therefore family members reunite together and worship the full moon on this day. Meanwhile, late summer is the harvest time of the year. Some said the Mid-Autumn Festival is for celebrating the end of the harvest season. So usually there are kinds of fairs and events for celebration. People in different regions celebrate the Mid-Autumn Festival in various ways. Other eastern Asia countries also celebrate this festival, like Japan, Korea, Singapore and Malaysia. Usually people will gather together, express their deep love for the family, and wish for a brighter future, as well as enjoy the full moon and eat mooncakes. The legend of the goddess Chang E is a well-known story of Mid-Autumn Festival. It is said that long long time ago, there are ten suns in the sky. Plants and crops died in the strong sunlight; rivers and lakes dried up; people dies of thirsty. Then there was a hero, named Hou Yi. He stood out to fight, used a magic arrow to shoot nine suns down from the sky. With only one sun left, the mortal world came back to normal. After that, Hou Yi met a beautiful girl Chang E and married her. They began to seek for medicines can keep life immortal. Hou Yi returned to Kunlun Mountain, at which he got the magic arrow, to find the medicine. This nice man took back the medicine, and was willing to share it with his beautiful wife, so that they can live together always. Yet he hadn’t expected that a villain neighbor set a trap in order to get the immortal medicine. As a result, Chang ate all the medicine by her own as she heard from the neighbor that her husband Hou Yi was dead. The magic power of the medicine changed her to immortal as goddess. Chang flied onto the moon, and from then on, lives in the palace of the moon alone. Since then, every year on the night Chang E flied to the moon, the moon was especially clear and bright. It is said that you can even see her silhouette. The mooncake or Yue Bing (月饼, yuè bǐng) is a traditional Chinese pastry that is mainly eat during the celebration of Mid-Autumn Festival. It is round in shape, made of different flavors. It has thousand years history. In folk legends, it is said that mooncake was invented in the end of Yuan Dynasty. During 1279 to 1368, China was dominated by Mongol. Han people couldn’t bear to be charged by a foreign nationality. They started to revolt. There was an army leaded by Zhu Yuanzhang who planned to revolution war on the evening of lunar Aug 15. But at that time the Mongol government searched for revolter. So Zhu thought to sue mooncake to deliver the message. They wrote the message of the time of war on a slip of paper, and hide the paper in cakes. In this way, they protected the message from the government, and successfully started the fight on that night. After the revolt army won the war, Zhu Yuanzhang gave the mooncake to those meritorious officers and soldiers. From then on, the mooncake became popular as a special desert for Mid-Autumn Festival, and was developed into various types of flavor and appearances. Nowadays the mooncake’s making is not limited by materials. The recipes of making moonckaes now are varied; include various ingredients like salted egg yolk, lotus seeds, nuts, peanuts, meat, dried fruit, red bean paste and many others. All kinds of interesting and tasty fillings are wrapped in the small cake. You will never know how it tastes until taking a bite on it. Mooncake is a sweet and delicious dessert. To have a companion beverage that refreshing as tea will be much more enjoyable for tasting its flavor. Cantonese mooncake is made in traditional method. They are often mixed with a lot of sugar, sometimes tastes over-sweet. 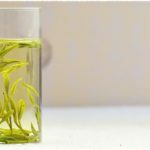 A cup of Tie Guan Yin, especially the moderately roasted or heavily roasted, can smoothen the flavor of mooncake, makes it more delicate. Taiwan is a producing place of various oolong teas. So why not have a cup of Taiwan Oolong Tea when enjoying Taiwanese mooncakes? Taiwanese mooncake tastes crisper. 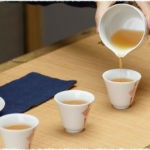 Thus its best mate is Taiwan Oolong tea, which has fresh and fragrant flavor, such as the Taiwan Ali Shan Oolong Tea, and Taiwan Qing Xiang Dong Ding Oolong Tea. Snow-skin mooncake is made with an iced crust instead of the traditional flour skin. Being an iced pastry, it is not suggested to serve with hot tea. Cold tea would be a better choice. 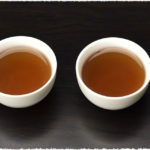 You can also enjoy it with a cup of flavoring tea or green tea, such as some black tea with milk, dragon well tea or Bi Luo Chun.